When Stick realizes Bosten is gay, he knows that to survive his father’s anger, Bosten must leave home. Stick has to find his brother, or he will never feel whole again. In his search, he will encounter good people, bad people, and people who are simply indifferent to kids from the wrong side of the tracks. But he never loses hope of finding love – and his brother. She shrugged. “I don’t think so. I think it’s cool. Everyone else is so…the same. You know? Stick. Bosten. Emily. Strength. Brothers. Talking through pipes. Best friends. Being different. Catching crabs. Anotia. Bubble baths. Jock straps. Surfing. Breaking out. Milkshakes. UFOs. Beanies. Playing California. I wasn’t all that fussed with Stick’s road trip. What I really liked about this book was that even though there was a hell of a lot of dark and gritty subject material, it wasn’t gratuitous or done purely for shock factor. Except for one scene just over half way through. I don’t think it added much to the story except make the reader feel uncomfortable and shocked. But that might just be me. And I know I know that California is made of rainbows and sunshine and the Kardashians wonderful stuff…. But does it hold the power to solve every problem with surfing and no pants at breakfast? 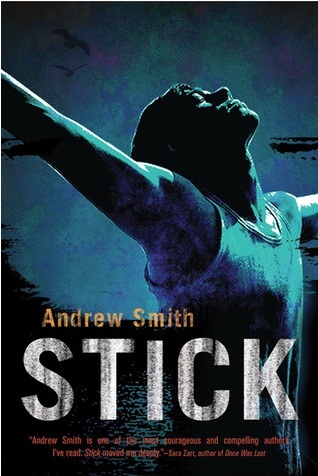 I fell in love with Stick from page one. For such a damaged, insecure and slightly clueless boy his narration was absolutely hilarious and always endearing. I just wanted to wait patiently for him to hotwire a car because I haven’t the foggiest where one would start with doing something like that sneak out and go and get burgers and Cokes (You can have a vanilla milkshake if you want Stick, but I don’t like them.) And even though he often didn’t think with his head and got into situations which made me have literal kittens, he always thought with his heart. Love Interest. Best Friend. Soul Mate. Oh gosh… Emily. EMILY! Cute. as. a. button and I wish you and Stick could run away and live in one of those whitewashed beach huts you see on British beaches where nothing bad could ever to the two of you and everything is perfect. Emily and Stick’s relationship really reminded me of Jenny and Forrest’s, which is never a bad thing in my book…. And in this one! “Kids in eight grade liked nipping at you. Worse than cornered crabs, even if you weren’t missing any parts. Oh and Buck? Yeah, more kittens were had. 10/10. Mate, this book should come with a warning. I purposely didn’t read any reviews for this before I went into it because I didn’t want to know what happened and, even though the synopsis hints at the sadness in this book… well those little hints did NOT prepare me for this book. Mr Smith depicted these dark subjects in such an unnervingly calm and almost off-hand way that perfectly illustrated how sickeningly normal it was for Stick and Bosten to live in this way. And I think that was the thing that upset me the most. The ending, without giving too much away, really reminded me of Unhooking the Moon. I haven’t decided whether that is a good thing or not. People who are looking for great contemporary YA. People who don’t mind putting on a stone with all the comfort eating that will happen on completion of said great contemporary YA. People who have ever felt like an outcast. People who know how to hotwire a car. People who think vanilla milkshakes People who like to take walks on the beach and catch crabs. People who like to take baths (HA and also ‘awwww’). People who find jock straps uncomfortable. People who don’t like to wear underwear at breakfast. People who wee in wetsuits….for warmth. Californians.